Where do Lava Domes Form? Lava domes can form anywhere associated with volcanic activity. They are commonly found within the crater of large composite volcanoes, such as Mount St. Helens, but are not limited to this location. They also often occur on the flanks of volcanoes. Lava domes can also be completely isolated from other volcanic features, or they may also occur in chains. Ultimately what determines where a lava dome will form is the magmatic plumbing system that supplies them. 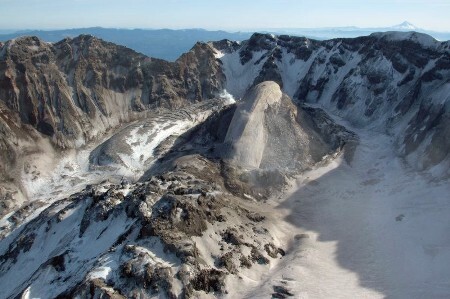 The two Mount St. Helens lava domes are examples of lava domes which form in or on the flanks of large composite cones. Lava domes such as these will ultimately one day rebuild Mount St. Helens. Chillahuita is an example of an isolated lava dome which is, however , related to many other domes in the area. Francis, P., Oppenheimer, C. 2004. Volcanoes. 2nd Ed. Oxford University Press, New York. How Does a Lava Dome Form? What Are Lava Domes Made Of?